Modular design is a proven, cost-effective technique for optimizing construction, minimizing operational downtime, maximizing fabrication quality control, and substantially reducing costs over field construction. On every project, ChemPro utilizes 30 years of modular plant design experience and multi-disciplined capabilities to provide you with a custom modular plant design, including the most cost-effective combination of services. We can develop and manage your project from inception through start-up using proven engineering skills coupled with the latest, state-of-the-art modular fabrication techniques. 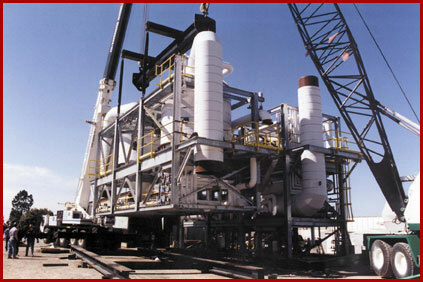 When considering modular construction, it is crucial to involve ChemPro at the earliest possible stage in the project. The best time is at process conceptualization. Early ChemPro participation in establishing process design parameters and final equipment selection will leverage our process know-how and modular design experience to produce the most cost-effective solution for your requirements. We are experienced in selection and configuration of equipment (pumps, heat exchangers, vessels), as well as construction techniques that best lend themselves to modular and prefabrication concepts. In addition, instrumentation and controls, even block valves, should be selected with space considerations in mind. These critical decisions can have a major effect on a modular plant layout. Careful design and specification of components using a “Modular Mindset” can result in substantial cost savings and will improve ease of access, operation, and maintenance within the modular unit. Clients that take maximum advantage of ChemPro’s process know-how and modular expertise are rewarded with a cost-effective, well-designed, and smooth-running plant.